David Incle joined the firm following completion of a judicial clerkship with the Honorable Dennis R. O’Brien J.S.C. in Monmouth County Superior Court. During his clerkship he was responsible for handling the Court’s motion calendar and assisted in the disposition of summary judgment motions, discovery motions and actions in lieu of prerogative writs. Mr. Incle also conducted civil mediation, resolving disputes in the Special Civil Part. Prior to his clerkship Mr. Incle attended Rutgers University School of Law where he participated in the Hispanic Bar Association, Rutgers Business Law Review and the Intellectual Property Society. During Law School he completed an internship with the Honorable Marcia Silva J.S.C., and was the recipient of the Anschelwitz Memorial Award by the Monmouth Bar Association. Mr. Incle is a former collegiate athlete, having completed his undergraduate degree at Marist College where he was named to the Pioneer League All-Academic Honor Roll each year as a member of the football team. 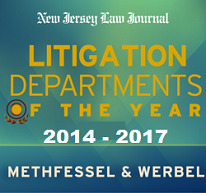 Mr. Incle practices on Methfessel & Werbel’s General Liability team under the direction of Paul Endler Jr.